Image Copyright: © 2016 James Bucki; All rights reserved. A special mint set often referred to as an SMS, is a set of coins issued by the U.S. Mint from 1965 to 1967. These coins are characterized by a better than average strike, since they were struck on higher-tonnage coin presses than circulation strike coins, but they were not struck as Proofs. SMS coins do not have any mint marks. Special mint set consist of one coin of each circulating type in the year it was issued: cent, nickel, dime, quarter, and half-dollar. The coins were sealed in special packaging. In 1965, a clear vinyl soft plastic called "pliofilm" was used; in 1966 and 1967, the coins were placed into hard plastic cases. Both sets originally sold for $4.00 per set. Why Make Special Mint Sets? In 1964 the dime, quarter and half-dollar were made out of 90% silver. By 1965 the price of silver was increasing to the point that the silver contained in the coins was worth more than the face value. This led to everyday people hoarding silver coins and then selling them to be melted for their bullion value. Eva Adams, Director of the United States Mint at the time, blamed coin collectors for the coin shortage that was impacting the United States economy. Because she unjustly blamed coin collectors for the shortage, she decided to remove all mint marks from United States coins beginning in 1965. Mint marks were returned to coins beginning in 1968. Additionally, proof sets for collectors were no longer made during this time. 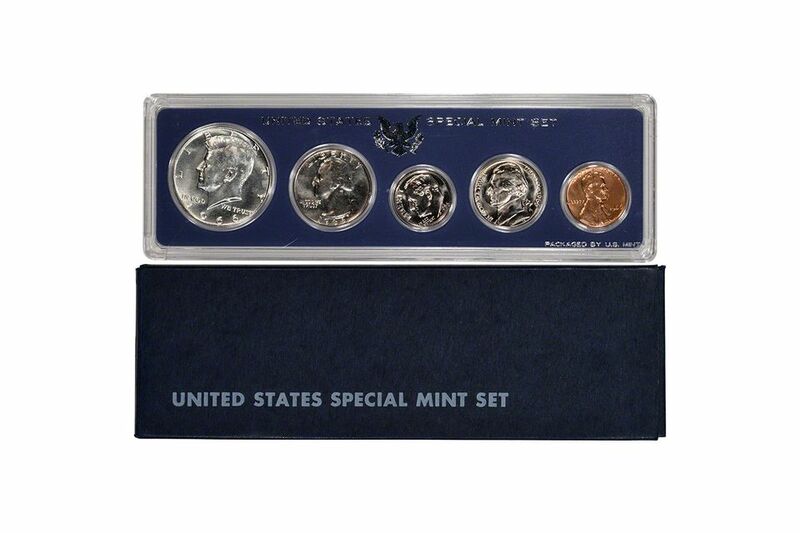 In order to appease the collecting community the United States Mint started to produce the special mint sets. These sets were sold to collectors at each of the mint locations and via United States mail. The coin dies used to produce these special coins were prepared in a similar fashion to coin dies that were used to make proof coins. The dies were pickled in an acid to produce a frosted finish on the die. The dies were then polished in such a way that the field of the die had a mirror-like surface. The blanks used to produce the special mint sets did not receive any special treatment before they were struck. Unlike proof coins, that were burnished before striking. The coining presses used to produce these coins used extra pressure to bring out the detail in each coin. Also, unlike proof coins that receive multiple strikes, special mint set coins only received one strike. Beyond the special mint sets produced between 1965 in 1967, the United States Mint sporadically produced special mint strike coins between 1950 and 1978. These unique examples are stored in the National Numismatic Collection at the Smithsonian Institution. From 2005 through 2010, the mint produced special satin finished coins that were used for the United States Mint Uncirculated Coin Sets. They also produced special mint strike coins for the 2009 Lincoln Bicentennial cent. Although the sets were specially made for collectors, millions of them were sold each year. Therefore, they are commonly available at Internet auction sites, coin shows or your favorite coin dealer. However, the first few coins made from the specially prepared coin dies exhibit proof-like cameo contrast characteristics. The sell for a premium above the regular special mint set prices.